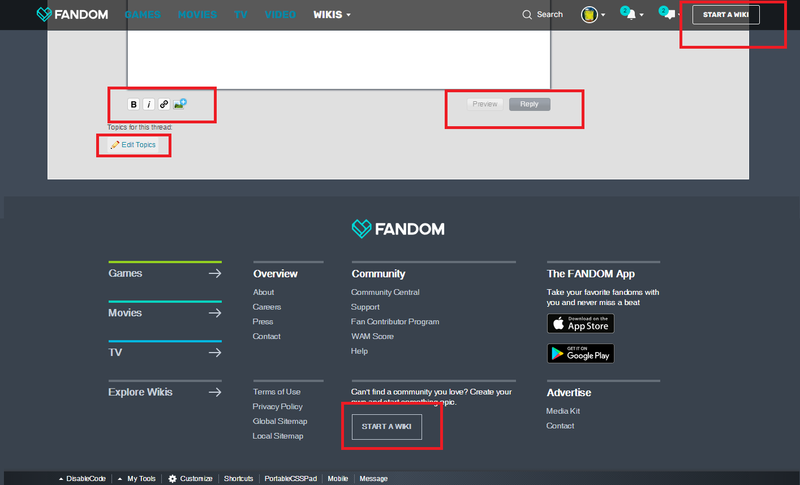 In this week’s releases, you will see some updates to the FANDOM global navigation bar that appears at the top of every page. These updates bring wiki and Discussions desktop and mobile pages into alignment with the general navigation style that’s been present on FANDOM editorial pages for some time. However, this is a brand new design coming to all types of pages and a big next step in the Modernization work we’ve been doing since last year. The top navigation bar is responsive, meaning it will adapt to different window sizes. The links in the top navigation bar (Games, Movies, TV, and Wikis) are localized for top languages, so there will be an easy way to discover communities in these languages. The theme of the global navigation is darker. The navigation bar remains visible at all times, for all users. This makes search, notifications, and the user menu easily accessible. Please note: For Discussions pages, only the post list and post detail pages will be updated this week. The rest of Discussions pages will be updated in a future release, likely next week. Additionally, the top and local navigation bars on mobile pages have been designed for maximum functionality with minimum space. Local navigation will be moved from inside the menu button of the top navigation bar to a more prominent location. When the user scrolls down, the global navigation and local navigation areas combine, leaving focus on the community name and the search button. A few months ago we talked about how we were focusing on modernizing the code and performance of the mobile site. The new mobile navigation design represents an early change to the look of mobile web and the next stage of Mobile Modernization, with more design improvements to follow throughout the rest of the year. These changes are important because they bring consistency across devices and for all types of pages on FANDOM. Users will have an easier time moving around the site and navigating between various communities and types of content. These changes also provide a secondary benefit in having more code shared between all products, making it easier to add improvements in the future. Native dark theme global nav, more prominent mobile navigation, it looks good; I am liking this release! Will some of the already queued/reported mobile bugs like <tabber> galleries in infoboxes failing in Mercury, notification symbol overlap in Safari mobile browser when on a Discussions page, et cetera be getting attention while this is being released? Ooooh nice layout! I like it a lot! Beyond removing the "breadcrumb" link above the article title, there are no changes happening to anything beyond navigation, with this release. But we'll continue making improvements to the mobile layout. I am happy to report that by virtue of the redesigned notifications entry point, the overlapping count/badge bug in Safari is resolved. Will the global nav dropdown(s) be dark themed too, or will they stay light themed? They will remain light themed. Yes. Headroom.js code used by the current Global Nav will also be gone. HM100 wrote: Yes. Headroom.js code used by the current Global Nav will also be gone. Is there any simple personal JS to fix that? This is a really great update to see! :) I like this update! Looking forward to the new mobile nav in particular, was a shame when local navigation got buried (although it seems like the desktop nav color has yet to make it). Found that update broke icons in the new module's headings for all but the ones done via ConsistentModules of DevWiki script. This new look has been appared at ~13h30 (Paris hour) in my desktop. FANDOM powered by wikia become FANDOM. "powered by wikia" is disappared. This looks very distracting, and the fact that you can't scroll past it is not great for navigating on desktop. Is there a way to disable this for a wiki? Anyone who can help me in fixing my header.css to restore the previous navigation style would be appreciated. I haven't done much with css in a long time, so no idea what edits need to be made to restore the older (and cleaner) navigation. Sorry, but it looks really ugly to me. The blue doesn't fit well with the white background at all, and the huge size of the words is just distracting. If possible, can you change it back, or at least let people have a way to change it back if they wish. When may I opt in? All users will see these changes as they are released. Wow! This is great update. It reminds me the classics of Wikia. I was visited Mixels wiki and Roblox Wiki, since I was a kid. I was always visiting the Roblox History from Roblox Wiki. It will matches the main FANDOM page. Sadly, Powered By Wikia was removed, but I think this update was really great. The problem of that was very distracting, and they tried to fixing the JS and CSS. Also, the local navigation is dead. Rest in peace Powered By Wikia, and Local Navigation. You will be missed. These changes are global and affect all users and all communities. There is not a way to opt out or change back. BertH wrote: These changes are global and affect all users and all communities. There is not a way to opt out or change back. You really shouldn't be surprised, these changes have almost always been designed to not be opt-out. If you want to revert it, you are gonna have to wait for someone to make personal CSS changes that you can use on your global.css page. I am similarly waiting for CSS fixes because I hate the new design. I also do not like the new way of styling avatars otherwise its okay this change. I would change the color of the topbar because on every wiki it's different and some fit but others don't. I don't find it annoying on the Kim Possible wiki but on my Justin Bieber wiki it doesn't fit. So could you change it to a lighter color that fits on every page? The navigation bar color does not work on all wiki. When the design is clear and/or light, it is waaaaaaay too distracting. I just don't get why you can't give the option to choose between white or dark. That's not that complicated to do. Lady Junky wrote: The navigation bar color does not work on all wiki. When the design is clear and/or light, it is waaaaaaay too distracting. Well it makes perfect sense to me why they would make a dark green/blue and red banner that goes great with any wiki. Especially since it's such a neutral design. I'm sure it doesn't distract at all from the majority light-themed wikis. Also I love how you have to click out of the wiki you're on to see anything on FANDOM. Really attracts site visitors to FANDOM that way. I also love the way it's been "localized" for languages but still shows up in English for all of Europe. Nothing on the navigation bar is showing up for me, aside from the link to Fandom, it's completely blank. This has to be the zillionth change to the navbar in the course of a few years. The current navbar is designed to look the same on all wikis, which is problematic as not all wikis look the same. You can't be saying that the current state of the navbar is a "one-size-fits-all" design because it isn't. On a wiki with lighter themes or themes other than the shade of blue the navbar uses, the navbar sticks out like an eyesore. The navbar should adapt to the theme of the wiki; why not make it, to an extent, customizable in Special:ThemeDesigner, or at least match the colours set in there? Secondly, the ability to hide the navbar by scrolling down is what made me happy in the first place. I could simply hide what I didn't need to use right now as I focused on reading the text. Even in previous navbars, the navbar would at least fade and become translucent when I scrolled down, so it responded to my scrolling. Why remove a feature that was so useful to again permanently fix this navbar on my screen that never goes away? You need to stop forgetting advice people gave you in the past and repeating the same mistakes. You also need to cut it out with this "no opt-outs" scheme and give people the choice to use your new changes or stay with the old for even just a little while longer. Instead of just suddenly migrating everyone to the new, have it available as an opt-in beta feature and collect feedback then rather than releasing it as final right away, with no method of reverting, and then waiting for feedback. It could still belong to them, even if the color is different. They could still simply give the choice and please everyone. You keep changing the global nagivation but when are you going to change the footer? it's been like this since years. I mean, I can get behind the general design, it's not bad...but the font choice makes it look a bit tacky and the colors are absolutely horrid. The black/teal/red is so vibrant that it sticks out way too much on just about every wiki I've visited, including here. Really I don't know why the navbar's been changed so much, with each design being worse than the last. I feel the one where it turned transparent gray when you scrolled down and was white at the top of the page was the best. don't say this, the footer is good, I don't want them to destroy the design like that too. Main problem so far is the fact there is no light option. Guess I'm the only one with this problem. Syeerol wrote: I really hate this new sitebar. Please reverted it back. They won't do that. You have to use Personal CSS for that. Okay, and where's the Personal CSS? I'm not really liking that blue-green color, but at least it's darker shade. There should be an option to change the color of the bar for lighter-themed wikis. Or at least have two options, "light" and "dark"
The new bar is a huge eyesore on light-themed wikis. A simple switch depending on the color would be nice. It sounds like you might be viewing the desktop skin on a mobile browser. We're aware of that issue that's occurring right now. Is the the extremely large recent wiki activity icon intentional? It's appearing on all wikis as far as I can tell and the size of it seems quite silly. A lot of wikis have a design that doesn't fit with this bar, it's really annoying that it can't scroll down, and the tiny red triangles just don't fit with anything. From a design and usability perspective, the old navbar was much better. Just so you know, the font is Rubik. Glad to hear it's already been reported, although it's a shame we can't change the size via css. I was hoping that if the change was intentional I'd be able to shrink it myself. I'm guessing it's possible to fix it with some JS, but that seems like a little more effort than it's worth since it's already been reported as a bug. I am. Thanks for your reply. Not all wikis...I haven't seen it anywhere so far. Here's what the rail looks like on the main wiki I admin. Totally agree, this color scheme just clashes with some wikis. It would be fine if the navigation still hid itself on scrolling, but since it doesn't a little customization could go a long way. Even just a light and dark alternative would be nice, and could be toggled in the theme designer to best fit each wiki. Here's a quick example with just a few colors toggled, of light, dark, and the current themes (a dark theme would be a better fit). Yeah, not a fan of a couple things, but particularly the color scheme itself. One wiki I admin on uses a blue theme and even then you can easily see this new bar clashes badly with our colors as they're in two different families of blue. If we can't do site-wide customization of it, I'd at least like to see a more neutral color themes available to choose from. Also why is the font so freaking big? I get it, you're trying to make it stand out, but it's almost to the point I can't even concentrate on the actual article pages. It takes me too many taps to search now, when I used to only need to tap once. CreationBeTheWorld23 wrote: It takes me too many taps to search now, when I used to only need to tap once. Are you sure you need to tap multiple times? I still only need to click once, since after you click the search icon or the word "Search" the typing bar is automatically focused so you can start typing immediately. I don't use Wikia on any device with a touch screen so maybe I'm wrong, but it looks to be just as fast as before. My biggest gripe with the change is the size of the bar now. Since you can't scroll down and make it auto collapse, it takes up a lot more room. But the navbar still has the id of globalNavigation so it's probably possible to write a JS script that will collapse it for you. Edit: while not quite what I was looking for, someone has written some CSS and put it on the dev wiki that shrinks the navbar from 55px down to 32px. link for those interested. What a surprise. Wikia staff forcing things on users without any freaking option of changing it. Want an example? How about them forcing videos on wikis without anyone's permission? I know they don't need our permission, but in my experience, asking a community what they think before adding something is a better way to go. As Forge the Hybrid mentioned, it should still just be one click/tap and you can start typing. If you're finding it's more steps for you, please use Special:Contact to write in and give us more details, we may have some questions. I really can't say that I like it. It doesn't fit into our wiki at all and that it doesn't collapse makes it even worse. KailynnKat wrote: I really can't say that I like it. It doesn't fit into our wiki at all and that it doesn't collapse makes it even worse. Nonetheless, I love this design; it looks awesome. I also believe you did a great job on the new page header buttons. Has the activity icon from the Recent Activity Module gone? I love this new theme. Can someone link the class change diffs? Personally I don't like it. I think the main reason some people like it is because they have a dark wiki so having a dark nav helps it blend. Otherwise I see the change pointless, other than from a consistency perspective (losing track on the number of times the nav keeps drastically changing). It would seem that Fandom, uh FANDOM, doesn't know what their brand is. The bar is incredibly distracting, especially on wikis with lighter themes. It would be slightly better if it hid while you were scrolling so that it didn't take away from the content when you were trying to read, but it doesn't. It also clashes horribly with almost all of the wikis I'm on. DEmersonJMFM wrote: Can someone link the class change diffs? What's worse. They dropped all Headroom.js data, preventing us from making the nav different while scrolling and also made the avatar styling harder. I like the former but not the latter. After some searchin', they did a lot of droppin' and rewritin'. CreationBeTheWorld23 wrote: Just so you know, the font is Rubik. Wikia staff, could you confirm this? Where is the Navigation Bar when I click on Full Site? This new update also put a weird bug onto the community pages of all the wikis. DEmersonJMFM wrote: After some searchin', they did a lot of droppin' and rewritin'. Is there any way to reduce the font of the new Navbar? its makes it more difficult to click on links on other wikias without accidentally clicking on it instead because it takes up much more space then before. I don't have the problem on every wikia, but some of them I do since when i scroll I expect it to disappear and click it on by mistake when I try to click on something else. Yep. Example from a wiki I admin to the right. I've reported it to Special:Contact/bug; I suggest doing the same. SageM wrote: Is there any way to reduce the font of the new Navbar? switching out 14px for your preferred font-size. Note that this doesn't shrink the navbar itself, it just makes the Games/Movies/TV/Video/Wikis text smaller. If your goal was to make the entire thing smaller, take a look at this CSS Script. The 2017GlobalNav CSS Script might also be of interest. In my opinion, the new modern elements look really nice but instead of updating the header and the main buttons only, the team should work on standardizing the aesthetic on all Wiki elements such as the WikiaBar or the Profile Masthead. Currently, the site as a whole looks incomplete with bits and pieces of different styles thrown everywhere. If there was a consistent, minimal design across all elements, then only would the changes enhance the website. But until then, they don't stand a chance. I don't see any of my notifications on the new nav bar. I am on full site and all I see on that bar is Fandom link. Nobellion wrote: In my opinion, the new modern elements look really nice but instead of updating the header and the main buttons only, the team should work on standardizing the aesthetic on all Wiki elements such as the WikiaBar or the Profile Masthead. Currently, the site as a whole looks incomplete with bits and pieces of different styles thrown everywhere. If there was a consistent, minimal design across all elements, then only would the changes enhance the website. But until then, they don't stand a chance. It would have been nice to put this on a test wiki at least a few days before the full roll out so people could fix up their CSS and JS that depends on the setup of the UI. I'm sort of meh about it otherwise. I don't mind the "modernized" look of the new nav bar. But the search bar does not display in certain resolutions. For example, on my tablet, it does not show any notifications and only displays Fandom on the top left. SahaTo wrote: I don't mind the "modernized" look of the new nav bar. But the search bar does not display in certain resolutions. For example, on my tablet, it does not show any notifications and only displays Fandom on the top left. I've been also experiencing that problem. Anyway, you can report it to S:C/B. I don't really get what's the point of keeping the "start a wiki" button, as it's not that people start wikis everyday. Similarly, I don't want to know what's with making those Fandom categories as important as the "main product" wikis are, size wise. The "FANDOM" button is already there, so I can't see why it can't have a dropdown similar to the "wikis" one and browse categories there. By the way, it's interesting to see how the Wikia name has been completely removed. There goes the company name. This is just my opinion, but I feel like there should also be a light theme as well and when you scroll throughout the page (on desktop) it hides itself. For me personally, I find it distracting that the main page of the wiki, like when you're reading an article, is bright in contrast but then you have the navigation which is dark. (Most wikis I go on, or work on take advantage of the light contrast for it's colors and images....) So, I was thinking that there should be an option in which an admin of that wiki can change it between light and dark. Sorta like the Live! Chat, how you can turn it off and on except it just switches the color of the top bar here. I think the second thing I mentioned is self explanatory, but also... when scroling through the page there should be like a button to hide it that top bar or have it hide itself.... sorta like the My Tools bar at the bottom! Kudossko wrote: Oooooo this is cool!! For me personally, I find it distracting that the main page of the wiki, like when you're reading an article, is bright in contrast but then you have the navigation which is dark. So, I was thinking that there should be an option in which an admin of that wiki can change it between light and dark. Sorta like the Live! Chat, how you can turn it off and on except it just switches the color of the top bar here. Okay, I think the dark theme is fine, but I do have problems: Why doesn't the bar, which I feel is a lot bigger than the previous one, disappear when I scroll down? That was an excellent feature, a good way to split the difference of having a bigger bar vs. having the page be clearly visible. And yes, I do feel there should be a way to easily change it back to white, because this does clash quite a lot with the color palet of individual wikis. The greenish-blue is not as neutral as goof old black and white. Side note: Yes, I saw the previous comment of the thread linking to the JS editing thingy, but I feel that should be the default rather than a hack. Ugh, it's just ruining things for mobile. No more easy access to userpage, no more notifications. Or at least for me, it's just showing the text "FANDOM" and nothing else, so it's basically useless. EDIT: And search, which is shown in the pictures, isn't there either. Not even a search bar below the header. Name one feature that exists with the current system that didn't with the original. That's right. There are none. You just took stuff away. No you can't. Please revert all changes you made to the global nav. Since its indeed to be for FANDOM's branding, only personal changes are allowed. Lumpofsomething wrote: who are you? Can you please remove all sitewide global nav customizations to your wiki you linked. I do not want to reveal my real name here. i dont need your real name :) but if you want to make such request, there should be Fandom next to your name, right? Lumpofsomething wrote: i dont need your real name :) but if you want to make such request, there should be Fandom next to your name, right? HM100 is correct -- per FANDOM's customization policy, changes to the global navigation are not permitted. You are free to adjust your personal customizations (visible only to you) as you see fit. Can someone please tell me how am i gonna change this color scheme of this bar? That's an image mock-up, not actual css. You might be interested in w:c:dev:2017GlobalNav, however. Okay I know that bar is update, then how am i gonna change this color scheme? at the top, along with any other imports you may have. The header works on some wikis, but on other's it's like the picture you'd get when you look up "Eyesore" in the dictionary. It would kinda be better if the staff made it be set so it could be customized by the staff/administrators on each wiki, along with the rest of a wiki's color scheme. It stands out like a sore thumb and looks extremely ugly on some wikis. The word FANDOM doesn't appear when I changed to 2017 Navigation Bar. How am I gonna fix this? Yes, this new header is hampering editing, even small tasks, via mobile. Full screen is the only mode in which the needed icons appeared; not even a search bar. I don’t think that was a neccesary change. The new color scheme is also, while on brand, jarring. Syeerol wrote: The word FANDOM doesn't appear when I changed to 2017 Navigation Bar. How am I gonna fix this? I like the fact that it's been brought up to date with the modernised branding, but the colours can be really jarring on light themes wikis. Should definitely be an option to recolour it via Theme Designer or have it automatically recognise light or dark theme communities and change as such. Guyus24 wrote: I like the fact that it's been brought up to date with the modernised branding, but the colours can be really jarring on light themes wikis. Should definitely be an option to recolour it via Theme Designer or have it automatically recognise light or dark theme communities and change as such. Actually, I'm gonna tell BertH. Can we revert back to the previous update, please? I don't have a problem with the header, what I do have a problem with is the large abnoxious recent activity image. If you could revert that part, I would have no complaints. Hey Syeerol, I made this! As Forge said, its a mockup, not a custom stylesheet. I took screenshots after messing around with the css via the browser's inspector. Assuming 2017GlobalNav resets it to a white background, "FANDOM" disappears because its color is also white. Unlike the other text, it is set directly in the svg path's fill property, not a css class. It can still be changed with css, but in order to only target that specific text (and not accidentally alter other svgs' colors) you'll need something like a :last-child selector of the parent svg's #id. Only do this on your personal CSS! Hopefully we'll get some official options at some point to use site-wide. will this come with any possible bugs? It shouldn't since ids are supposed to be one-of-a-kind per page and it only affects the the last path tag that's been enclosed by an svg with the id of wds-company-logo-fandom-white. That said, if you do manage to find somewhere it adversely affects another area I'd be happy to take a look at it. The code only affects the text. What about the bar color? I’m on mobile, and the bar at the top is blank. Yeah, that happens on my device as well, but fortunately, they reappear in landscape mode. Positive Elixir Trade wrote: The code only affects the text. What about the bar color? The code I posted was only to change the color of "FANDOM". You'd have to use something like w:c:dev:2017GlobalNav, which changes the bar color but not the text of FANDOM. The Nameless Lancer wrote: I’m on mobile, and the bar at the top is blank. Known issue. If your device's screen is 767px or smaller, all icons disappear but the FANDOM one. 768px or bigger, everything appears as it should. Is it gonna get fixed soon? It should, hopefully very soon since it affects so many users. I'm no design specialist, but imho they should have caught this problem waaay before they pushed the navbar update out to us. Can confirm that I need to click the search bar at least 2 or 3 times; very user unfriendly. To make it even worse, if I request desktop view on mobile, the new header doesn't render outside of the default page view, meaning that when you zoom out to see the whole page, the entire right half of the header (including the search bar) is cut off. F-Lambda wrote: To make it even worse, if I request desktop view on mobile, the new header doesn't render outside of the default page view, meaning that when you zoom out to see the whole page, the entire right half of the header (including the search bar) is cut off. To be honest, I don't even see anything on the top navigation bar in desktop view on mobile, not even the things that should be on the left half of the bar (games, movies, TV, video, and wikis); all I see on the bar is the Fandom logo. A screenshot to demonstrate what I'm talking about can be seen here. F-Lambda wrote: Can confirm that I need to click the search bar at least 2 or 3 times; very user unfriendly. Report this bug to S:C/B. These bugs are creeping me out. As mentioned above several times, a light-coloured option would be great. But the colour wouldn't bother me that much, if the bar would still disappear when scrolling down. I really don't see how this change is an improvement. The bar was always easily accessable by just scrolling up a tiny bit. And it wouldn't take extra space from the page away. I've just requested a userstyle for Stylish (I know there are CSS options, but they're only for personal use). I won't be having this. GUYS! For those who want a light themed navigation for light wikis, you can add it in your personal CSS. See c:justLeafy:LightGlobalNav4LightWikis. This sounds pretty cool! Could you link an example so I'll know what it looks like? Wikikinetic wrote: This sounds pretty cool! Could you link an example so I'll know what it looks like? Unfortunately, I can't, since you need to add it to your personal CSS. Just take a close look at the screenshots. Yes. I mean, it would work if you put it site-wide. But the truth is, you're not allowed to do that. You are only allowed to put it on a personal level. If there was no customization policy for this, I would've made it available for site-wide use. Hmm...in that case, I guess we'll still need to get Fandom's attention if we want to let this feature be available for users who don't know that this forum exists. Thanks for providing the link for people to use in the interim, though! This looks really good, particularly on darker themed wikis. Maybe some options for lighter themes or themes whose colors clash with it would be nice. When will I be able to go to see if I got any messages with my Touch Screen Phone so I don't have to do that on a computer? Yyp wrote: This looks really good, particularly on darker themed wikis. Maybe some options for lighter themes or themes whose colors clash with it would be nice. I mean, on Mobile, I cannot see my profile picture, search bar, bell, or notifications. All I see is the logo of FANDOM. Its Naseeb wrote: I dislike this thing. Same here. This is a big enough problem for people like me who want to get between multiple pages on my phone but want to see the latest changes (because mobile mobile view caches the page), but for someone who only uses a mobile device and ever wants to access desktop features, this could be an enormous problem. For example, if a wiki admin wanted to access their admin dashboard but their computer broke, they'd have virtually no way to do so. Yes, I wish we had the old one. I sincerely hope that this fix happens, as this would be invaluable for reasons stated above. Also, thank you, Minato826, for relaying this information! What happened to the old one? I mean no one likes this one. Its Naseeb wrote: What happened to the old one? I mean no one likes this one. And FYI, "no one" liked the white one either when it was rolled out. Not sure about anyone else, but if I count as someone, from an aesthetic point, I like it. And if they re-added headroom.js it'd perfect. Drops in an ocean of silence. Fifteen minute's rage over a sudden change is always more vocal than support. It happens on any change, on Wikia Fandom powered by Wikia FANDOM and everywhere else. By now, I'm indifferent. I block out the top nav, same as I did on the previous version and even the one before. As should be clear, making theme decisions like these are really subjective. Of course, if you want a different look just for yourself you could use something like w:c:dev:DarkGlobalNav which is more neutral in theme. While it's not permitted site-wide, you're welcome to use it for yourself. Mobile issues are a different matter, though — those should be fixed soon. Myself 123 wrote: Nothing on the navigation bar is showing up for me, aside from the link to Fandom, it's completely blank. You mean the lack of a search icon, avatar icon and so on? I just found out about this when I changed the mobile setting on my phone. It’s not helping here. It's a bug that's known and being worked on. It's mentioned before (and mentioned as mentioned before) multiple times above. FANDOM bar is causing issues on my mobile devices. I have to get to my profile, message wall, and contribs through link, and cannot view my notifications at all. I think its a good idea, but wikias should be able to customize the bar for their wiki individually. The blue bar doesn't look good on all wikias. The mobile bug is pretty big to have been missed. Makes me nervous about dev and QA process at FANDOM. I suspect not many best practices are being used. I've finally finished restoring the bar back to the styling I previously had (minus the inversion). I decided to keep the dark theme though. For 2018-2019 A Suite Pack (Personal only CSS) I finished the styling it required. See here for styling and depends on CSS Variables most things but some depend on Light/Dark theme instead of CSS Variables. Please contact us about this and we'll have some additional questions about your experience and system setup. You shouldn't need to click search more than once. As has been noted, the issue with viewing the desktop site on mobile browsers is being worked on. You can switch to the mobile view to access search, notifications and the user menu if needed. I didn't have a problem with the scrolled up bar. All you needed to do was to scroll up a little bit. Glad to see it's already known, but I'd just like to confirm the behaviour I'm seeing in oasis from mobile (Chrome on Android) - just the fandom logo on the far left of the global nav. It's particularly annoying when mercury doesn't support a number of namespaces. I almost thought search had been removed. This would seem to indicate that something about the slide transition is buggy. I am currently using the latest version of Edge on Windows 10. I just discovered that using side-by-side window view on desktop triggers the same bug as desktop view on mobile (1366x768 screen, making it trigger on desktops skinnier than 384px). I've done my own (extremely small, on one browser/os combo) testing and it appears that if your browser is 767px or smaller everything but the FANDOM icon disappears, and if your browser is 768px or larger everything is as it should be. Forge the Hybrid wrote: I've done my own (extremely small, on one browser/os combo) testing and it appears that if your browser is 767px or smaller everything but the FANDOM icon disappears, and if your browser is 768px or larger everything is as it should be. It's a nice change but the fact that we can't navigate for other users makes it really inconvenient for mobile users. I wonder how long it will take for FANDOM to fix the bug. The updates to mobile web pages (the mobile skin) and desktop Discussions pages were released today. Local navigation is now much more accessible for mobile users. And check out the nice animation on mobile web pages when you scroll! Positive Elixir Trade wrote: I wonder how long it will take for FANDOM to fix the bug. Still having trouble with the nav bar on mobile. But really, it's still not fixed for me. Also, don't say Clash Royale editors. Cuz me get angry. And you no like when me angry. Anon3610 wrote: Still having trouble with the nav bar on mobile. It only works when you're in Discussions. Will there be anymore updates to the global navigation bar in the near future? Definitely. Given that FANDOM fixed the nav bar in discussions, they're definitely going to be covering everything. Then guess I should wait before fixing my CSS navbar style. What code were you going to use to fix it? I hate the new one. I am getting pissed because I have to turn my screen the whole time to see if I have messages or my account link. That's a bug, not a feature, so that in itself is not a reason to hate it. At least, not after they finally fix it. Can you revert back to the old header until the mobile bug is fixed please? Myself 123 wrote: Can you revert back to the old header until the mobile bug is fixed please? Does it make any difference which kind of web browser? Appears not. The issue is based on window size, although it's certainly possible different browsers interpret the code differently. If FANDOM did their testing properly, everything should be more or less identical. I have Opera and the Navigation Bar is blank. I just hope this bug was really missed by FANDOM QA/dev and not that is was known and reported, but some program/project manager or other person made the call not to fix it. This happens. That's what Wikia wants me to do: use the inferior mobile site until I get used to it. I'm not falling for it, I'm gonna keep using desktop until the problem is solved. No, this is just a bug. No sinister ulterior motives. So the narrow window bug is still around, right? Is there anything else obvious? I have to click on Mobile Site to be able to login and see comments on discussions it is impossible in Full Site and I can not see if I got message on a wiki or a forum I have to manually go to thoses places. Does a phone make a difference? If your device is 767 px or less, everything on the bar disappears. I have no idea what you just said I have Samsung Galaxy XCover 2 you tell me? Will it help if I do a clear slate on my Opera Browser and restart my phone? No. Your phone is simply too small. FANDOM needs to fix the bug. It's nothing restarting your phone will help. No. Your phone is simply too small. FANDOM needs to fix the bug. Restarting your phone will not help a global bug. Banarama wrote: Does this fix work? Does this work for displaying the full navbar? My comment is only about the new color scheme. I don't dislike the dark teal menu bar, but it is really hard to find complementary colors that work with it and with our content. Most shades of blue don't work. And when we are trying to help other users, we have referred to the "white" menu bar to differentiate it from our wiki's "blue" menu bar. What was wrong with the white? Dark themes have been popular on many wikis, so I suppose this is an attempt to offer something nice to them. You can always import a custom theme personally, and I'm sure there's other ways to refer users to the global nav such as "the one with the heart logo" or something. Even after all these years, I never made the connection between the logo and a heart. Makes sense I guess. Sorry. I don't think I can bring myself to vote on it. Tupka217 wrote: Don't get your hopes up. I'm not trying to!!! Why are so hard to understand and talk to?? What did I ever do to you??? That's the problem with the wiki here, everyone is so so serious you can't make a joke. I don't know. I wasn't replying to you. I saw him talking to GET REXED 745. I am triggered. How long will it take for the bug to be fixed? ^ May take a couple days. FANDOM regularly releases updates almost every weekday, and I'm sure this is at the top of the list. Tupka217 wrote: They don't work weekends. Havana.swift wrote: Are they need security? security is also important. Pretty sure they can page people to come in if needed. I found a solution to hide the navbar when scrolling, and tweaked it a little so it works on FANDOM. Grudgeholderr wrote: I found a solution to hide the navbar when scrolling, and tweaked it a little so it works on FANDOM. I think we should add a documentation for this on the FANDOM Open Source Library. Since its just two css rules, it might be easier to include the css in the js snippet tbh. u don't need any timers for that. How do these guys know so much?? This is simple and it works. Put it in Special:MyPage/global.js or on a per wiki basis at Special:MyPage/wikia.js. Hey there - a quick update: I want to confirm that the empty bar when viewing the full site on a mobile layout is currently a top priority for the team. It's definitely not ideal, and we hope to have improvements live quite soon. Note: in the meantime, you may be able to view the missing options by ticking the "Desktop site" option Chrome's browser menu, switching to landscape mode (widening the browser area), or by switching to the mobile layout. Edit: this has also been posted as a separate thread to help with awareness: Thread:1483727. Edit 2: another method to view the contents of the global nav has been noted above. Kirkburn wrote: Hey there - a quick update: I want to confirm that the empty bar when viewing the full site on a mobile layout is currently a top priority for the team. It's definitely not ideal, and we hope to have improvements live quite soon. Note: in the meantime, you may be able to view the missing options by switching to landscape mode (widening the browser area), or by switching to the mobile layout. I have to say that was just lovely update, thank you, Kirkburn. Thanks for being aware of this bug. However, even if I switch to landscape mode, it still doesn't work, but I just use the desktop site instead for this case. I like the bar now, I've gotten used to it. Yeah, but in the mean time, use the desktop site option, or just use PC. The "desktop site option" - View Full Site - is the part that has this issue. You can get something similar through personal css, such as this script that I made. As announced on Thread:1484377, a fix for the blank nav bar on mobile devices is scheduled to go live tomorrow (July 18)! Uh, what? June 18th was last month, Kirk. What world are you in!? clearly, a world where everything is one month behind! Regardless of that, I'm glad to hear a fix will be going live tomorrow! Oh my gosh, it works. It works! Thank you so much. Dragonfly82 wrote: Oh my gosh, it works. It works! Thank you so much. I am glad the navigation bar works and that is enough for me. Thanks for finally fixing it. Now I'm just going to unfollow this thread to avoid getting lots of notifications for it. Yeah, it looks like it stops showing at very low resolutions. I'll flag this up with the team, thanks! The update of this bar seems very good! It's very useful. On the other hand, will the color stay dark? Because this color does not fit all wikis. Again, the color should be able to be toggled in the Theme Designer. Positive Elixir Trade wrote: Again, the color should be able to be toggled in the Theme Designer. Popstar792 wrote: Please don't ban me for this. Don't worry. A real offense would be an insult or worse. Yeah, I don't understand why you're always restricting the users of your platform like this. FANDOM isn't going to block you from the site for having a critical view of the global navigation panel. They encourage users to give feedback, thus the existence of Special:Contact/feedback and Community Council. Really nice layout. :) I love it.